Internet, mail, phone, and door-to-door scammers are all around, trying to con people out of their money. They may tell a victim that they have their family members in custody, or say that if the victim gives them a few bucks, they can collect a million dollar reward. 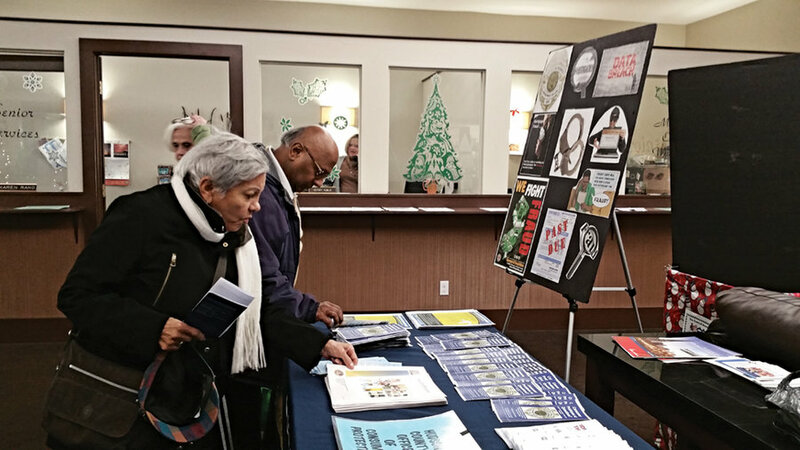 According to the Anti-Fraud Toolkit presented by the New Jersey Division of Consumer Affairs (DCA) at the Secaucus Senior Center on Dec. 7, these scammers frequently target people 60 and older. That’s because seniors own a home and have good credit, and are less likely to report fraud. Steve Lee, director of the state DCA, gave the free presentation for all residents of Hudson County. Friends Carole McLeod and Wedad Youseff came from Jersey City to learn more. Secaucus Director of Senior and Community Services Lisa Snedeker said to the seniors, “We want to keep you as informed as possible on fraud and scam.” She said that she and her mother had both fallen victim to scams. The Anti-Fraud Toolkit is filled with information about dozens of popular scam scenarios, including fraudulent immigration enforcement calls. These immigration calls involve a scammer convincing the victim to give them money to keep a family member from being deported. In one situation explained in the toolkit, the scammer refers to himself as a U.S. customs and border patrol representative. The toolkit is also filled with important phone numbers and online contacts to report being scammed, getting unwanted sales calls, or to assure you’re donating to a legit charity, getting home improvements done by a real contractor, or to check if you’ve been a victim of identity theft. The DCA also recommends keeping a list of suspected scam callers, and the toolkit provides a list to record the information. To read or download the full Anti-Fraud Toolkit visit www.fightingfraud.nj.gov.